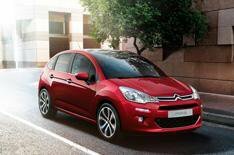 2013 Citroen C3 revealed before Geneva | What Car? The face-lifted 2013 Citroen C3 has been revealed ahead of its official unveiling at the Geneva motor show in March. The revamp brings changes to its front, rear and interior, while a pair of new engines will help cut CO2 emissions. At the front, the face-lifted C3 gets a restyled Citroen 'chevron' logo and bumper-mounted LED daytime running lights, while new tail-lights and reflectors are the extent of rear-end updates. The interior gets a new strip on the dashboard in black, brown or grey while a fresh seat fabric is also offered. A new shade of blue has been added to the range of colours, taking the total available to nine. There are two changes to the C3's engine range a 68bhp 1.0-litre petrol replaces the current 1.1-litre, while the 1.4-litre diesel gets a 5bhp power boost to 115bhp. The new petrol unit does an average of 65.7mpg and emits just 99g/km of CO2. A reversing camera has been added to the C3's options list, while rear parking sensors will also be offered. Final prices haven't been confirmed, although they're not expected to stray much from the current car's range of 10,890 to 16,590. Sales for the new C3 should start towards the end of May.